Every family has traditions--- the moments played on repeat where you go through the same actions, have almost the same conversations over and over again. For my mother and me, we don’t have to wait for Thanksgiving or Christmas dinner to roll around in order to partake in a well-established and beloved family tradition; any meal will do. And it goes like this: I will get soda, while Mom takes up a glass of water. Now, I don’t care if it’s got ice and a lemon stuck in it, water is something for taking a shower, going a couple of laps in the pool, or loading into a water gun and aiming at my friends with it --- it’s not for drinking! She, however, disagrees, and will swiftly inform me after I have taken my first sip of--- ah--- refreshing soda, that all I am accomplishing is the destruction of my brain cells. And hard as it is for me to admit it, a part of me recognizes that she is right. What we eat and drink does have a huge impact on our ability to function. I’m sure that many of us have experienced a sugar high, and the subsequent sugar collapse. And there are many substances out there with a much more potent effect. But the risks become even worse when our eating or drinking directly impacts someone else. Pregnant women are asked to watch things like their caffeine and vitamin intake, to keep up a steady diet of fruits and vegetables, but even more important is their doctor’s advice to abstain from alcohol. Darke County Relay For Life invites Cancer Survivors to participate in this year’s event. Who is a Cancer Survivor? A Survivor is anyone, of any age, of any level of diagnosis, treatment, or in remission. We Celebrate YOU! Whether you are a newly diagnosed, in the middle of treatments, or have been cancer free for years, we honor you, support you, and fight for you!! It all starts with you, the SURVIVOR. Relay for Life is a time to Celebrate our Survivors! We can’t wait to see you again or meet you for the first time? YOU are the reason we celebrate at Relay for Life! Please join us as we relay towards a world without cancer. Invite Your Caregivers to Relay! 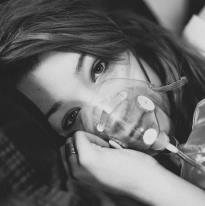 When a person hears the words “You have cancer”, their life is turned upside down. Cancer does not only affect this person’s life, but also the lives of their family, friends and loved ones. Together they will go through a very difficult journey to beat this cruel disease. A cancer patient needs their family, friends and loved ones to be their “Caregivers” during this journey. What is a “Caregiver”? The American Cancer Society has defined “Caregiver” as a family member, friend, loved one or other support person who lends physical, emotional, or other support to someone at any time during the cancer journey and continues for those who have lost a loved one to cancer. These “Caregivers” are a very instrumental part of the cancer journey. This year at the Darke County Relay for Life, we want to recognize all of the amazing Caregivers that have helped those with cancer. These Caregivers have given so much of themselves. We want to say “Thank You” for all that they have done, the Darke County Relay for Life has designated the 2nd lap of the event as the Caregivers Lap, with the 1st lap being the Survivors Lap. All Caregivers are encouraged to join us at the Relay for Life this year. Come experience this inspirational and emotional event. Survivors who wish to participate in this year’s event please complete and sign the attached form and send to Joyce Johnson, Survivor/Caregiver chair at PO Box 353 Gettysburg, OH 45328 (form must be signed in order to participate). This summer the Friends of the Green ville Public Library are hosting Lunch on the Lawn three times! These events will be in conjunction with Main Street Greenville’s “First Fridays” on June 7th, July 5th, and August 2nd. Each lunch will be provided by a different downtown coffeeshop and accompanied by live music. Everyone is invited to sit under the shade trees and enjoy. Feel free to bring your own lunch or just stop by for the music! Tables & chairs will be available but you may want to bring your own lawnchair or blanket. On June 7th Brenda’s Beanery will provide the box lunch: a Wrap (choice of turkey w/ roasted red pepper spread or chicken salad; Salad (choice of pasta bacon ranch or broccoli); Mini Scone; and Drink (ginger peach tea unsweetened tea, or lemonade). Just pick up a box at the white tent for $7. $1 of every lunch sold supports Main Street Greenville’s downtownmatters! initiative. A very special musical treat is in store for June 7th! 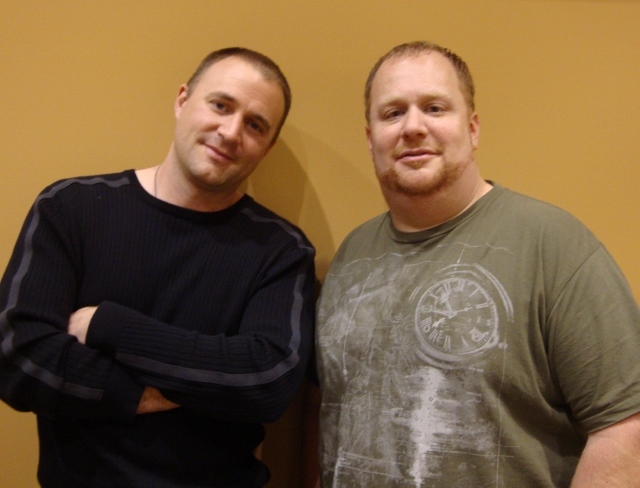 Chad Lemons and Tim Yount will perform vocals and acoustic guitar. They are the core members of the band “Quest” from EUM Church. They’ve opened at the Illumination Concerts for such acts as Tobymac, Big Daddy Weave, Newsboys, and Fireflight - as well as played in many area church concerts. They first got together seven years ago while participating in the music ministry at Ginghamsburg Church in Tipp City. Chad is originally from Illinois and Tim from West Milton Ohio. Both are married with kids; Chad teaches math at the Jr. High and Tim is a nurse. They’ve devoted their lives to giving to others and music is one avenue, especially in inspiring other men. Five of twelve original songs have been released on an EP “Place of Solitude.“ Chad explained they strive for lyrics that are meaningful and stylistically it’s 90’s rock. They do a lot of secular songs too and have a wide appeal. Be sure to catch their great music! June’s free movie at the Library! On Friday June 14th at 2:00 on the 3rd Floor - Daniel Day-Lewis in Lincoln. Don’t miss it! New Madison Public Library’s Board of Trustees will meet for their regular monthly meeting on Tuesday, June 4 at 6 p.m. rather than June 10 as previously scheduled. Additionally, the library’s Transition Team will meet at 5 p.m. on Tuesday, June 4 and again at 10 a.m. on Thursday, June 20. All meetings are open to the public and will be held at the library, 142 South Main in New Madison. Call 937-996-1741 with questions. The next meeting of the “Living with Cancer” Support Group will be held on Thursday, June 6 from 7:00 to 8:30 pm (try the Bio-Mat 6:00pm-7:00pm. The meeting will take place in the third floor conference room at Wayne Health Care. Emily and C.J. Jasenski, owners of elementsLife School of Healthy Living, will be sharing information about Bio-Mat Thermotherapy, a therapeutic mat that uses infared technology to help initiate and speed healing. elementsLife provides many Healthy Living programs and services including a One to One Therapeutic Yoga program. “It is within the One to One program that we have seen the greatest results for clients challenged by numerous chronic illnesses”, remarked Emily. “We hope to educate more people about the healing opportunities that the Bio-Mat provides and look forward to helping the Living with Cancer Support Group members experience it themselves”, she added. “The Bio-Mat is an amazing tool for healing and very easy to use. All you need to do is remove your shoes and lay down on the mat, the Bio-Mat does the rest”. The local Cancer Association of Darke County sponsors the Living with Cancer group in cooperation with Wayne Hospital. The Support Group is open to anyone with a cancer diagnosis, also family and friends of an individual with cancer are encouraged to attend. Facilitating the support group meeting this week will be Christine Yount and Jill Brown from Wayne Health Care from Wayne Hospital. For further information, contact Christine Yount at the Cancer Association of Darke County office at 548-9960. Office hours are Monday, Wednesday, and Friday from 9:00 A.M. to Noon and 1:00 to 4:30 P.M. The Mississinawa Valley FFA chapter attended Ohio’s State FFA Convention on May 2-3, 2013. The Convention was held at the Ohio State fairgrounds. Members that attended the Convention were: seniors Preston Deeter and Kelsi Amspaugh; juniors Chelsea Skidmore, Lindsey Hunt, Joe Schmitz, Jacob Breymier, Logan Nelson, Mason Roark, and Nicole Scholl; sophomores Heather Dirksen, MacKenzie Dirmeyer, Lane Manning, Kaelyn Marker, Hunter Coning, and Stephanie Scholl; Freshmen Levi Livingston, Chance Garber, Brad Slyder, Zach Dirmeyer, Leslie Dirksen, Kasey Hummel, and Megan Wilson. On Thursday, May 3rd, the members arrived in Columbus. Most of the members enjoyed the career show, while others represented the chapter interviewing for the Chapter Development Model of Innovation and proficiency awards. That night all of the students and chaperones attended Skyzone which consist of many trampolines they could jump on; this was one of the highlights of the trip. At the second convention session Thursday evening, Chelsea Skidmore received the second place proficiency award for Dairy Production Entrepreneurship. Skidmore’s SAE consisted of 26 dairy cows and heifers. Some achievements through her SAE included Junior Champion Brown Swiss heifer in both the Junior and Open shows at the Ohio State Fair and Junior Supreme Champion heifer at the Great Darke County Fair. Skidmore plans to further expand her SAE this year by breeding for high-type heifers and good milk production. On Friday, the students attended the fourth session where officers who received gold ratings were announced. 2012-2013 officers Reporter Chelsea Skidmore and Treasurer Joe Schmitz all received gold ratings on their officer books. The chapter received Gold Metal ratings. The chapter was also recognized for donating to the two state FFA charities Children’s Hospital donating 2,000 dollars, and CROP/Church World Services donating 200 dollars. That evening the students went to the final session of the convention. At this session, the state FFA degree recipients were announced. The FFA chapter had four recipients this year, Jacob Breymier, Kelsi Amspaugh, Chelsea Skidmore, and Joe Schmitz. The students had a great time as always, and are looking forward to next year’s Ohio State FFA Convention. The Mississinawa Valley FFA is proud of all award winners and wishes them luck in the future. Mississinawa Valley FFA is a satellite program of Miami Valley Career Technology Center. FFA is a student organization that promotes premier leadership, personal growth, and career success through agricultural education. adoptable pets from the Darke County Animal Shelter. With June being Adopt-a-Pet Month, The Darke County Animal Shelter will be hosting it's third annual open house Saturday, June 15, 2013 , from 12 to 3 p.m. Free food and drinks will be available to all. Free raffles of Kitchenaid and other donated items plus a children's coloring contest will be part of the festivities. The Darke County Animal Shelter is located at 5066 County Home Rd. Greenville, Oh. Anyone adopting a dog on Saturday, June 15 from 9:00 a.m. to 3 p.m. will receive a $10.00 discount toward the adoption fee courtesy of the Darke County Friends of the Shelter. Bring along your canine companion(s) for a day of fun at the newly opened Scentral Park located right beside the animal shelter. If a warning has been issued or a tornado has been spotted in the county ONLY sirens in the impacted area will be activated. This will eliminate any confusion in other parts of the county that are not experiencing inclement weather. The Sheriff will activate the impacted area’s outdoor weather siren when the National Weather Service issues a tornado warning for the area that the siren serves. The project of activating outdoor warning sirens from the Darke County Emergency Communications Center located at the Sheriff’s Office is now complete. Some residents in county Villages will notice a change in testing of these sirens. Beginning June 3, 2013 sirens located in Ansonia, Arcanum, Ithaca, Bradford, Burkettsville, Gettysburg, New Madison, Wayne Lakes, North Star, Rossburg, Union City, Versailles, and Eldora Speedway will be tested the first Monday of every month at noon. If inclement weather is occurring and/or is forecast to occur that day, the monthly test will be postponed until the following month. This decision will be made at the discretion of the Darke County Sheriff’s Office Administration. The City of Greenville will continue to activate their own sirens however, a back-up activation point has been added to the Darke County Emergency Communications Center. The Workshop Learning Center is Moving, Growing & Expanding! The Workshop Learning Center is moving to its new location at 732 Jackson in Greenville. The Workshop currently offers private music lessons, academic tutoring and a part-time preschool. “Our new location will allow us to better serve our current students and expand to offer additional programs,” says director Michelle Drees. The new location will open June 3rd with individual sessions and June 10th for group classes. The Summer of Music and Learning is about to begin! The Workshop Learning Center has a wide variety of summer options. The Summer Kindergarten Readiness Program is a 7 week curriculum designed for students entering Kindergarten in the fall. Math and Reading Power Hours are offered Thursday afternoons to help avoid “academic loss” during the summer for students entering grades 1 – 5. A piano and string instrument camp will be held the first full week in August. Drees states, “We are always scheduling new students for private sessions. Each family and student is unique and we create a curriculum and schedule that will meet their individual needs.” Students are tutored in a wide variety of subjects for many reasons. “We have Kindergarten students working on letter identification and sounds and high school students preparing for the ACT and everything in between.” The Workshop currently has four tutors that are matched to each student’s schedule and needs. All tutors are state certified teachers with classroom experience. The biggest addition to the program is a full-time daycare. The Workshop is currently accepting applications for children ages infant through school age opening in September. Full and part-time preschool programs are also enrolling now. 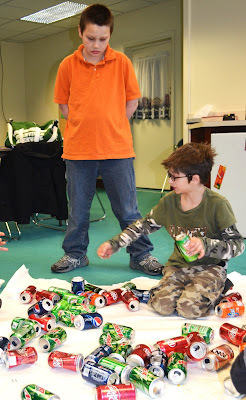 Low student to teacher ratios, a focus on purposeful play and hands on activities are the core of the program. The expansion into full-time daycare will allow The Workshop Learning Center to serve another need in the community. If you would like more information on any program offered, you can email michelle@theworkshoplc.com or call 937-459-5937. You can also check us out on Facebook and our website www.theworkshoplc.com. On May 2nd and 3rd, Chelsea Skidmore of the Mississinawa Valley FFA Chapter, traveled to the Ohio FFA Convention and was the winner of the Dairy Production-Entrepreneurship Proficiency Award! Skidmore interviewed on Thursday and found out her placing on Friday at the third general session. Proficiency awards are given to FFA members, who through their Supervised Agricultural Experience, have developed skills that will help them in their future agricultural career. By placing 1st in the state, Skidmore’s application will be critiqued and forwarded to the National FFA for further evaluation. Skidmore’s supervised agricultural experience consisted of a herd of 25 dairy cows and heifers in which she managed and cared for on a daily basis. Some of her achievements include over 23,400 pounds of milk per cow, 5th place at the World Dairy Expo, and Junior Champion Brown Swiss of the Junior Show at the Ohio State Fair. Skidmore is the daughter of Sandy Skidmore and is a junior at Mississinawa Valley. Skidmore plans to further her SAE through genetic improvement by breeding for good milk production and high type traits. She plans to further her education beyond high school by attending the Ohio State University with a major in animal science. Upon completion of her degree, she wishes to move back to Darke County and manage a dairy of her own with a herd of close to 300 cows. Congratulations Chelsea and Good Luck at the National Level! Community. The second of the 2013 series will be held JUNE 11, 2013 @ 3 PM in the Brick Room. 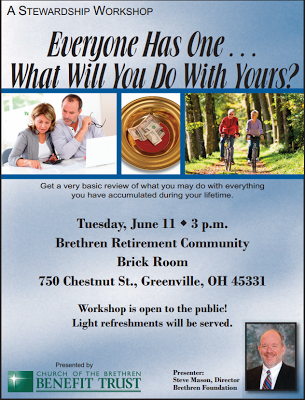 BRC welcomes the community to join us for this informative topic - "Everyone Has One...What Will You Do With Yours?" Brethren Benefit Trust provides employee-based financial services, including a pension plan, an insurance program, and a foundation. Brethren Benefit Trust serves more than 5,000 members. An open house to honor Ann Riegle's service as Director of the New Madison Public Library has been scheduled for Thursday, June 13th. Guests can enjoy cookies and punch, and chat with Ann from 2 to 4 p.m.
Riegle has been Director for 12 years and is leaving to join the Dayton Metro Library system. Her service has included growth in the library’s technical areas, greater involvement with the state library system and innovative children's programming. During her tenure she led the successful campaign for passage of a levy to stabilize the library's programs and services, and to replace decreases in state funding. The Board of Trustees, staff and Friends of the Library invite the public to this open house. The Board of Trustees has hired Brenda Miller to become interim director during the summer months. The children's summer reading program will continue to offer hours of fun, enriching, learning adventures. The Board is actively seeking a full time replacement for the director's position. Interested individuals may refer to the library’s web site for additional information. The library is located at 142 South Main Street, New Madison, Ohio. Gwen Tinkle is president of the Board and available at 996-5315. Commissioner Mike Stegall will be interacting with the residents at the Versailles Health Care Center located on State Rte. 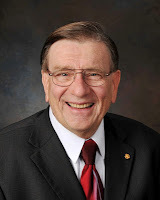 121 east of Versailles on June 8th, at 9:30 a. m.
Commissioner Stegall will be discussing the direction Darke County is headed in, and taking questions from the residents in attendance. Family members are welcome to attend. The Commissioner believes that residents of nursing facilities and assisted living homes are entitled to have complete access to their elected officials. Commissioner Stegall believes if the residents can’t come to him, he will go to them. This is an opportunity for the public and the residents to meet their elected officials and to pose questions or concerns about the county. Please join Commissioner Stegall on June 8th at the Versailles Health Care Center at 9:30 a.m. until 11:00 a.m. in Versailles. This great race is back for the best year yet. Start your 4th of July Holiday early with the 6th Annual Victory 5K Run/Walk. 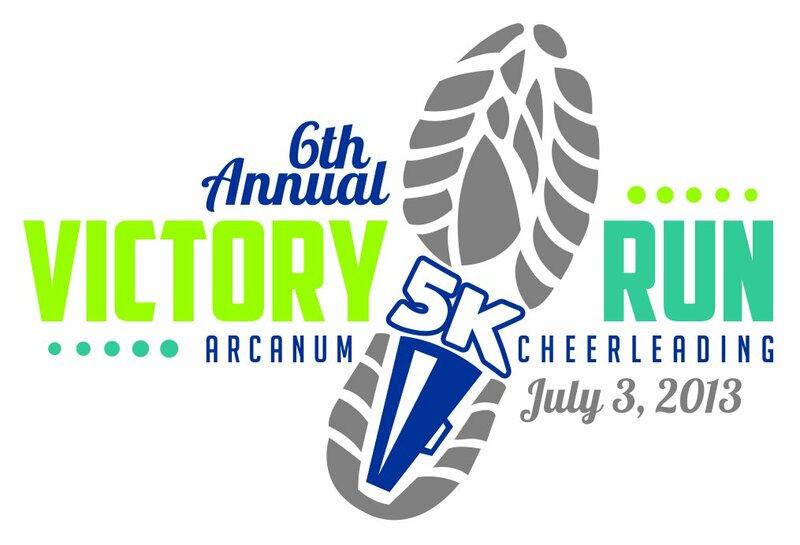 The Arcanum High School Cheerleaders are hosting their annual 5K on Wednesday, July 3rd beginning at 7:00 PM. The 5K will begin at the AHS track, travel through Ivester Park, the historical streets of downtown Arcanum, and finish back at the track. Walkers are welcome! Entrants will have 1 hour and 30 minutes to finish the course. Race day registration begins at 5:30 PM. You may register online at www.speedy-feet.com or you can print a registration form there and mail it in using the instructions at the bottom of the entry form. Register by June 21st to receive a t-shirt! 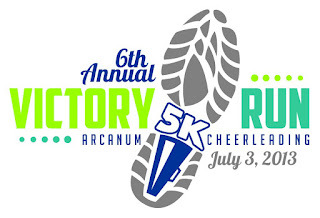 Grab your tennis shoes and race on over to support the Arcanum High School Cheerleaders. On May 29, 2013 at approximately 3:31 PM the Darke County Sheriff’s Office Clandestine Drug Lab team arrested Robert Harris (26) and Jennifer Murphy (39). 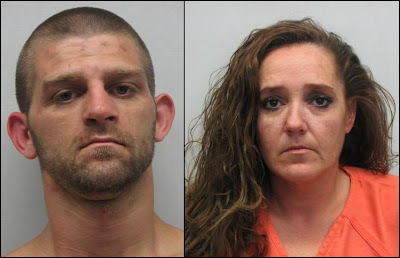 Both are from Greenville, Ohio and both were arrested for Illegal possession of chemicals for the manufacturing of methamphetamine in a residence located at 110 West Main Street Yorkshire, Ohio. Present in the home at the time of their arrest were a 14 and 15 yr. old female. While searching the residence items used in the manufacturing of methamphetamine were located in an upstairs room. Other items found in the house were Heroin and drug paraphernalia. This case is pending further charges and will be forward to the Darke County Prosecutor’s Office for review. On May 29th, 2013 at approx. 452 PM Darke County Deputies, along with Ansonia Police Department, Ansonia Fire and Rescue, and Careflight were dispatched to the 3800 Block of ST RT 47 E in reference to an injury accident involving a motorcycle. Preliminary investigation revealed a 2002 Honda motorcycle driven by Travis Simmons, 25 of Union City IN. was westbound on ST RT 47. Simmons lost control of his motorcycle on a curve and traveled off the right side of the roadway. Simmons was ejected from the motorcyle and came to rest in a field. Simmons was wearing a helmet at the time of the accident and was the only occupant on the motorcycle. Simmons was transported to Miami Valley Hospital by Careflight. Simmons condition is listed as fair at this time. Updated: The Tiger Has Been Returned! Update #3: Now WHIO is reporting that the Ansonia police have as many as 7 suspects in the theft. According to the article, one of the suspects was told they have four hours to come up with names and the location of the tiger. A short period later and the tiger was dropped off at the police station. Update: The stolen tiger has been returned and is at the Ansonia Police Station. If we hear anymore about the case, we will update accordingly. An elementary school community project meant to showcase the artistic ability of Ansonia's K-4 graders while promoting a sense of community pride has indeed brought the community together, after one was stolen from it's location on Main Street. Ansonia students in Chrissy Cox's art classes painted and decorated the tigers to display at various businesses along Main Street. 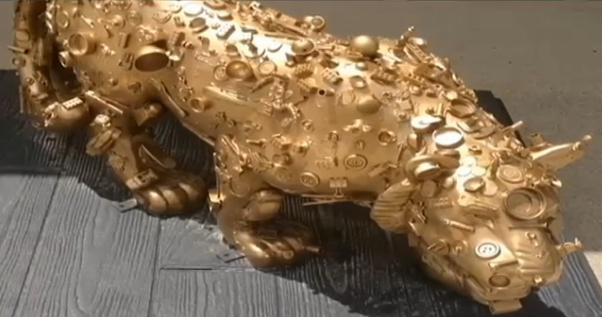 The Tiger that was located in front of the Lumber Yard was painted gold and covered in nuts, bolts, screws, and other hardware related objects. The fiberglass tiger was fastened to a large concrete slab. According to WHIO, Ansonia Police Chief Frank Shapiro believes someone pulled the tiger from the base with a chain attached to some sort of vehicle. It's not clear at this time who took the tiger or why, but the small village has seen a large coming together in support of locating it and pursuing charges against those who took it. Quarter Auction for "Corynna Strawser Benefit Fund"
We are having a Quarter Auction in the Youth Building at Triumphant Christian Center on June 1st from 6 to 9 p.m. Doors will be open @ 5 in case you want to come early and look around. We have vendors from Mary Kay, Pampered Chef, Thirty One, Tastefully Simple, Avon, and many many more. Come and support this great, brave teen. Invite all your friends and family. We will have something for everyone. Quarters can be purchased at the auction. Our community has come together to build a room for Corynna and they're almost finished. The proceeds of this auction will go towards expenses for this room. We would like to thank everyone who has had a part in the building of the room, whether it be time or materials. This auction will give you the opportunity to do your part and we want to thank you in advance for your participation and generosity. We look forward to seeing you there. Triumphant Christian Center, 1129 Southtowne Court, Greenville, Oh. 45331. Christmas trees, maple syrup and turkeys, are also grown and produced on Ohio’s farmland. Being a good neighbor means being responsible, courteous and respectful of others. Being respectful of private property and the need for farmers to safeguard their businesses will help preserve the rural landscape that everyone enjoys. Take the initiative to get to know your neighbors. Knowing your neighbors and letting them get to know you will speed the new relationship you will be building. Here are some tips to be a good neighbor. keeping their home sites presentable. Be a good neighbor and do your share. Keep your pets and other domestic animals restricted to your property. The open land may be a temptation to let your animals run loose, which may cause crop damage and put livestock under stress. Eight Greenville Senior High School Hospitality students recently competed at the Ohio Family, Career and Community Leaders of America (FCCLA) Leadership Conference skill event competition in Columbus, Ohio. Kelsey Brandenburg and Jessica Setser, juniors in the Greenville Hospitality Program earned a Gold rating and took home the 1st place state trophy in the Creative Banquet Table Design competition. In addition to their trophy, the students each earned a $6,000 scholarship to Sullivan University in Kentucky. Also earning top honors at the competition were senior Ashley Bowers who earned a Silver rating and placed 2nd in the state. Senior Ashley Byerly and Junior Kayla Vanata earned a Silver rating in Hotel Linen Operations and placed 3rd in the state. The Meeting Event Setup Team of Senior Brandon Gilbert, Juniors Taylor Meyers and Kylie Vanata earned a Gold rating and placed 3rd in the state. Greenville Hospitality students earned a total of $26,000 in scholarship monies. The Hospitality program is a two-year career technical program at Greenville High School and students train in many facets of the Hospitality industry including guest room services, facility maintenance, linen technology and banquet catering and service. Through FCCLA, students have many opportunities to compete at the local, regional and state levels and also log numerous community service hours through the local organization. 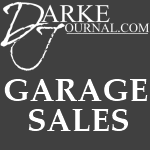 DarkeJournal.com's Garage Sale Page Has Returned! After a couple of popular years, we have brought back our garage sale listing page. There's already a couple of sales posted. If you have a sale coming up, feel free to take advantage of this free advertising. We will post the items as we get them, but categorize them based on the weekend they are happening. So you will see a list of weekends on the left side of the page, and you'll be able to click on the weekend to view garage sales for that weekend! Easy! 123 Fake Street - Kids toys, baby clothes, used furniture, tools, used electronics and more! Open 9a-5p Thursday, May 19 through Sunday, May 22. Send in your listing to darkejournal@gmail.com now and we will compile them and post them through the week! We will post the items within a day or two of receiving them, so submit them early! Click here, or on the link in the tool bar at the top of the page, or on the image in the right sidebar, to view the Garage Sale Listings page. 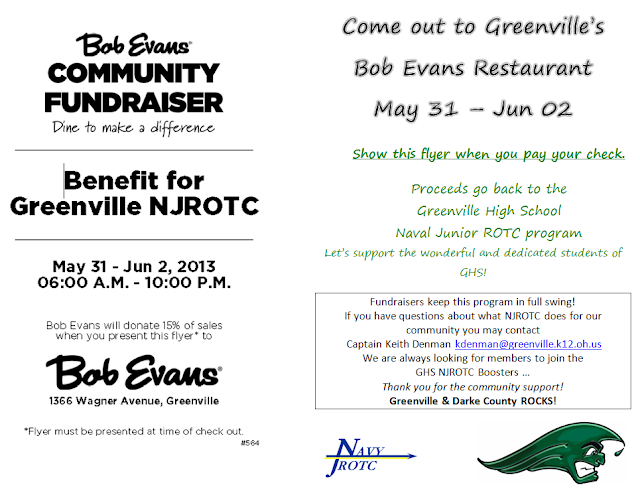 Bob Evan's will be holding a fundraiser for Greenville High School's NJROTC Program the weekend of May 31st - June 2nd. Fundraisers like these help fund the program and keep it thriving. Click on the flyer below to download a printable copy. Take it with you to Bob Evan's and 15% of the bill will go to the program. Dig Into Reading at New Madison Public Library when the Summer Reading Program begins Monday, June 3rd! Every participant who reads 20 picture books or 400 chapter book pages will be registered to win grand prizes including toys, games, books, stuffed animals and more. Participants may “finish” the program twice in order to earn another ticket for the grand prize drawing. The program is open to kids of all ages, from those who enjoy listening to stories up to age 18. The summer fun will begin at 6:30 p.m. on Monday, June 3rd with a Dig Into Buried Treasure party. Library staff will share pirate stories, crafts and a buried treasure hunt at the end of the evening. Families will have a chance to Dig Into a Good Book on three different occasions, June 12 at 10 a.m., June 25 at 6:30 p.m. and July 2 at 4 p.m. At each of these sessions, library staff will share a few neat stories and then help families find some good books to read together at the library. Superheroes will be the topic of the day on Thursday, July 11 at 4 p.m. when kids will design their own superhero. Storyteller Dedus Candy will Dig Into Ghost Stories around the fire pit on Monday, July 22 at 8 p.m. And finally, Dig Into S’mores and Stories will close out the summer on Friday, July 26 from 4- 5 p.m. LEGO Club will continue during the summer months on Tuesdays, June 18 and July 16 from 3-4 p.m. All programs are free and open to the public. The Summer Reading Program runs Monday, June 3 through Friday, July 26. The library is located at 142 South Main in New Madison. For more information about any of these Summer Reading Program activities, call 937-996-1741 or visit the library online at www.newmadisonpubliclibrary.org. Thank you for supporting our cancer patients in Darke County! If you have questions, please call the Cancer Association at 548-9960. 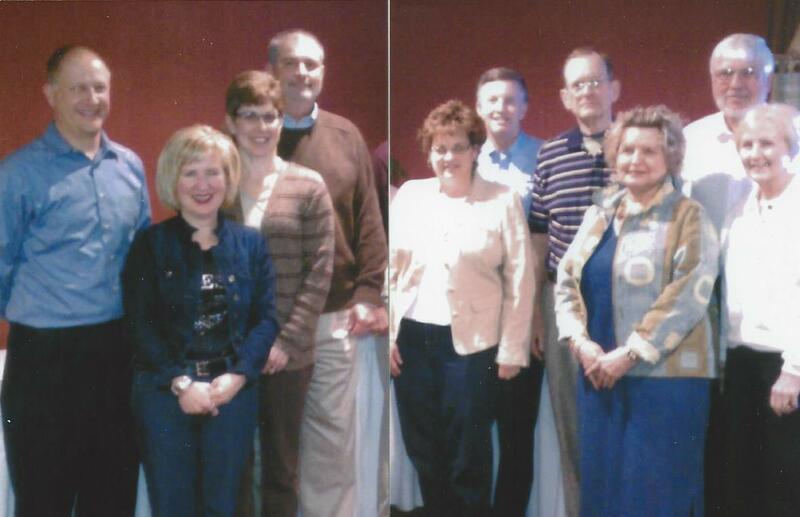 Pictured below L to R – 2013 Annie Oakley Golf Committee members Matt and Angie Arnold, Kent and Lynn James, John and Diane Swallow, Ray and Bettye Laughlin, Ed and Kay Curry. (Larry Ullery and Christine Yount ~not pictured. Preparations for the 32nd Annual Annie Oakley Golf Tournament are underway! Last year 104 golfers signed up for the 18-hole event, which benefited the Cancer Association of Darke County. Committee members for the tournament are Matt & Angie Arnold, Kent & Lynn James, John & Diane Swallow, Ray & Bettye Laughlin, Ed & Kay Curry, Larry Ullery and Christine Yount. This year’s tournament is scheduled for July 22 at the Turtle Creek Golf Course and will feature a shotgun start with scramble format, chances to win great prizes and dinner for the golfer and their spouse. Most importantly, the proceeds from this fun and exciting event will benefit the local and independent Cancer Association of Darke County. Lunch will be served at 11:30 a.m. with tee off time scheduled for 12:30 p.m. Each golfer has the opportunity to win a new car for a hole-in-one on the sixth and seventeenth hole. Any golfer getting a hole-in-one in the eighth hole will win their choice of premium golf equipment. The golfer getting a hole-in-one on the eleventh hole will win a Yamaha Golf Cart. For years, the Tourney has supported the local “Cancer Association of Darke County.” The proceeds from the tournament will provide benefits for transportation, prescription drugs, nutritional supplements and medical supplies for cancer patients living in Darke County. Additional information and entry forms for the 32nd annual tournament are available at the Cancer Association of Darke County (937-548-9960) or from any tournament committee member. Thank you in advance to all who help support this wonderful benefit for Darke County. with the total donation going to the Ronald McDonald House. Young people do volunteer! It is reported that more than half of teenagers in the US participate in volunteer work of some kind and most have an interest in making a difference in the lives of others. The Gateway Youth recently been working on a “giving back initiative” that shows appreciation of the support they have received from community members. They are finding ways to get involved in the community that also develops their skills and helps to foster their future personal growth. One of their first projects will be working as part of a volunteer crew in the upcoming First Friday Lunch. Gateway youth participants and staff are looking forward to being part of the volunteer crew for the upcoming “First Friday - Lunch on the Lawn” on June 7th from 11:45 to 1:00 pm. The youth invites everyone to join them at lunch time at the Greenville Public Library lawn; listen to the great music and sit a spell to enjoy part of the afternoon. Gateway Youth is a program of Council on Rural Services …programs for innovative learning that supports youth in Darke and Shelby Counties. For more information check the Web site at www.councilonruralservices.org , like our Facebook page, or call 937-548-8002. 5K FOR EDUCATION A SUCCESS! EUM Christian Preschool’s 5K for Education was a huge success! We started our morning off with a prayer and devotions by Pastor Sylvia McKibben, EUM Christian Preschool students leading the Pledge of Allegiance and the Greenville High School Band playing the National Anthem. Over 50 kids participated in the kids fun run and 240 racers took part in the 1st annual 5K for Education. The preschool was able to raise over $2,500 which will be used to purchase new learning materials for the school. EUM Christian Preschool would like to thank all the volunteers and racers that participated. 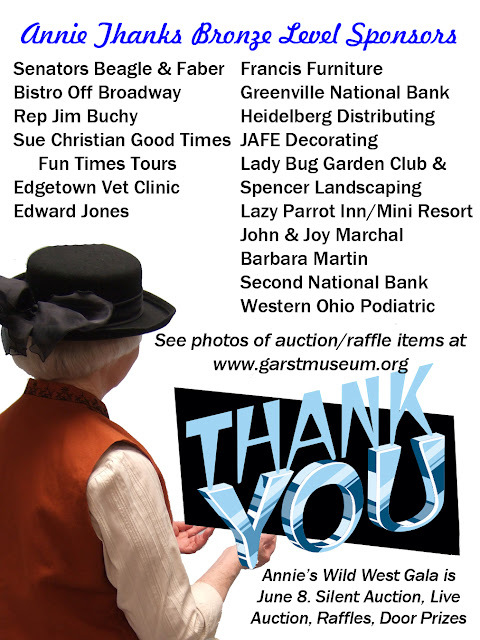 A huge thanks to all of our business sponsors: The Drafting Board; EUM Church; MJS Plastics; Rocketship Sports Management; Good Times Event Services; Mike Lavy Electric, LLC; Rapid Printing; Route 49 Transport; Village Green Healthcare Center; Cavalier Clothing; Integrity Ambulance Service, LLC; Cherry & Roberts Dental; Braund Pope Funeral Home; Greenville National Bank; Bud’s Chrysler-Dodge-Jeep, Inc.; Larry Fourman Construction, Inc.; Rumpke; Hupmans Lawn Care; John Trick Construction; Mary Lynne Hawley, MD; Dynes & Dynes, LLC; and Gary Flinn Co., L.P.A. They were an integral part of a successful event and we appreciate their support! Preschool registration for the 2013-14 school year is still open. If you are interested in having your child attend EUM Christian Preschool, contact Elaine Snyder at 937-548-3211 ext 210. EUM Christian Preschool is a ministry of EUM Church. Jeff Harper is Senior Pastor at EUM Church and our regular worship services are Saturday at 6:30 p.m. and Sunday at 8:15, 9:45, and 11:15 a.m. at our Worship Center located at 1451 Sater Street (corner of Sater and Sebring-Warner Road) in Greenville, OH. Kidmunity Children’s Ministry is available for kids age birth through grade six at the 6:30 pm, 9:45 and 11:15 am services. The Downtown Campus, 111 Devor Street, houses our offices and preschool. For more information, go to www.eumchurch.org or call 548-3211. 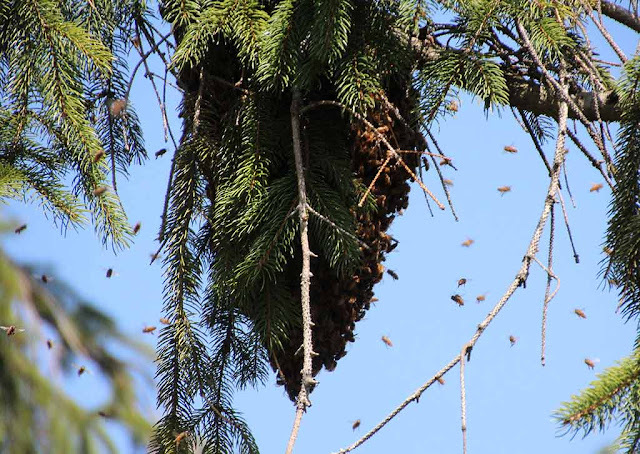 A nest of honeybees gathering on a branch of my spruce tree on May 15th. This group of honeybees left their home hive high up in a hole in an old maple tree. Apparently it was becoming too crowded, and a new queen brought bees with her and this was their first stop — in my spruce tree. I would guess there were several thousand bees there as it is a buzzing, living mass of honeybees. I called some honeybee experts from Dayton and a few minutes before they arrived, this nest of bees took off and where they went nobody knows. I was told that this breaking away from the original hive is how honeybees multiply and grow larger in numbers. 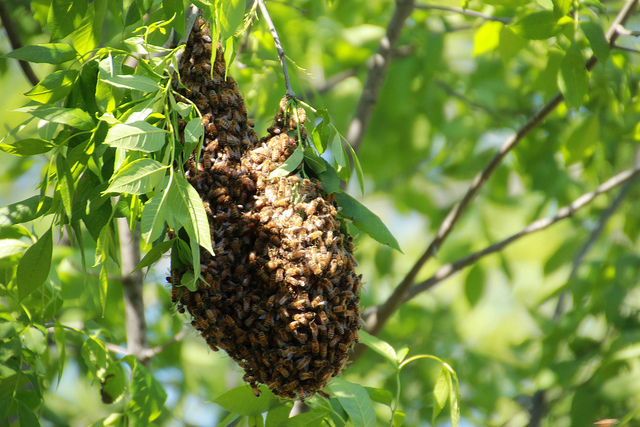 I am thankful the old hive is still in the hole in the tree that I call the "honey hole," and I am glad these are off somewhere making their new hive which will mean more blossoms will produce food and fruit this summer. There were two additional nests that formed on the ash tree but not as large as the first one. This was the second nest of honeybees, and it was hanging on two different twigs on the ash tree. About the time I was called for supper; I went to see if this second nest was still there but the nest was in the process of moving on. This was the first time I ever saw a whole nest of honeybees take off and spiral up until the last one is gone. I suppose they go to find a more permanent home they will have to build. Hanging on leaves is, I think, just to get organized. Anyway, up and away they went and the branch is now empty. I did not try to harm the bees. They made a lot of noise but they did not try to sting me. We need all of the honeybees we can have and without them the world would quickly run out of food to eat. Take care of honeybees and all other pollinating bees and insects—your future depends on it. Try to keep chemical sprays out of your environment. Are you 11–19 years old? Then you may need to be vaccinated against these serious diseases! Many people between the ages of 11 and 19 think they are done with their vaccinations. They think vaccinations are just for little kids. But guess what? There are millions of people between the ages of 11 and 19 who need vaccinations to prevent whooping cough, tetanus, diphtheria, hepatitis B, hepatitis A, chickenpox, measles, mumps, rubella, polio, influenza, meningococcal disease, pneumococcal disease, and human papillomavirus infection. Are you one of them? Getting immunized is a lifelong, life-protecting job. Make sure you and your healthcare provider keep your immunizations up to date. Check to be sure you’ve had all the vaccinations you need. Tetanus, diphtheria, pertussis (whooping cough)(Tdap, Td) In the state of Ohio, a onetime booster dose of Tdap at age 11–12 years, is required for entrance into the seventh grade. Tdap protects against the whooping cough disease that is sometimes life threatening for young children and infants. With the number of cases in Ohio on the rise, it is now more important than ever to protect our children by vaccinating against these diseases. ATTENTION ALL MOTORCYCLISTS: NextStep Ministries is hosting its second annual Bike Blessing and Benefit Ride on June 8th (rain date June 22) at the EUM Church Worship Center located at 1451 Sater Street in Greenville, Ohio. Registration will begin at 11:30 am with the Bike Blessing following at Noon and the ride at 1:00 pm. The price is $15 for a single rider and $20 for a double with a meal and door prizes following the ride. Join us as we ride through the scenic countryside and share our love of motorcycles and God's beautiful creation! Donations are welcome and the benefit ride will help fund NextStep Helps Ministry. Next Step Helps provides emergency help and assistance to the less fortunate in our community by providing help with utility bills, prescriptions, gas vouchers and information on other services and benefits in our area. Call 937-316-8420 for more information. NextStep Ministries is a ministry of EUM Church. Jeff Harper is Senior Pastor at EUM Church and our regular worship services are Saturday at 6:30 p.m. and Sunday at 8:15, 9:45, and 11:15 a.m. at our Worship Center located at 1451 Sater Street (corner of Sater and Sebring-Warner Road) in Greenville, OH. Kidmunity Children’s Ministry is available for kids age birth through grade six at the 6:30 pm, 9:45 and 11:15 am services. The Downtown Campus, 111 Devor Street, houses our offices and preschool. For more information, go to www.eumchurch.org or call 548-3211. Then they won’t want to miss a minute at The Kingdom Chronicles, the most exciting place around! At The Kingdom Chronicles, kids will learn the truth of God’s Word as they enjoy songs, crafts, games, goodies, and dramas. The Kingdom Chronicles promises to be filled with excitement, so contact us today! We’re calling all knights and fair maidens to join us in standing strong in the battle for truth! Is your child ready for kindergarten? There are many high-quality pre-Kindergarten programs in Greenville and Darke County to choose from, but the YMCA of Darke County’s program is second to none and offers year-round childcare and education. We offer a Pre-Kindergarten classroom for ages 4 and 5 in the Childcare Center known as Daycare II. The Lead Teacher is Ms. Terri Deal, who has a Bachelor’s degree in Education from Wright State University. The Daycare II program follows the Pre-Kindergarten Content Standards required by the Ohio Department of Education. Wendy Brenner’s son, Lucas, is currently in the Daycare II program and will be starting kindergarten in the fall. His brother Eric attended the Y’s program previously and is now a kindergartener in Greenville Schools. “The Y’s program is fabulous. It’s just great. I couldn’t imagine a better place for them to get a good foundation for their education,” Brenner said. Brenner said that she was pleasantly surprised to learn that both boys did very well on the assessment that incoming kindergarten students take before the start of the school year. She said Eric placed 10th overall, across the entire incoming kindergarten class. “The Y does a great job preparing them for the school environment,” she said. 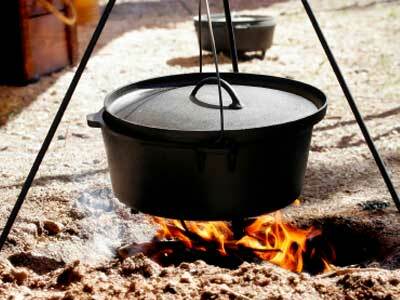 The warm weather is here and nothing beats making supper outdoors over a campfire. Whether you are an avid camper or just like being outside, bring the family and join the Darke County Parks for an evening of fun on Monday, June 10th at 7:00pm, as everyone will be able to cook some new, delicious appetizers and snacks over the open fire. Samples will be provided and a variety of techniques will be explored. Campfire Cooking will be held at Shawnee Prairie Preserve, 4267 State Route 502 West. Space is limited, so please sign up today by calling 937.548.0165. There is a fee of $5.00 per person. Join a Darke County Parks’ Naturalist for our series, Bike to Health! The Tecumseh Trail is open and ready for YOU to ride. The benefits of cycling are endless! Cycling is not only good for your heart, it helps strengthen muscles, control weight and increase your energy. We all want to lead healthier lives, but sometimes life just gets in the way! Our next Bike to Health program will occur on Thursday, June 6th at 6:30pm. July’s session will be Saturday, July 6th at 10:00am and the August session will be Thursday, August 8th at 6:30pm. Use these programs as an “excuse” to schedule outdoor exercise time. Riding on the trail allows everyone to move at their own pace. You can choose ride just a portion of the trail or the entire 7.2 miles! Dust off that old bike and meet at the Gettysburg Access Point (Bridge Street) and ride all or a portion of the trail. Families are welcome. Don’t forget your helmet and water bottle! Yorkshire - On May 27, 2013 at approximately 12:42 a.m. Darke County Deputies, along with Osgood Fire and Rescue were dispatched to SR705 and North Star Fort. Loramie Rd. in reference to a one vehicle rollover accident with three subjects injured. Osgood Rescue requested mutual aid from Fort Loramie rescue to respond to the scene. Preliminary investigation revealed that a 2002 Ford F150, driven by Aaron York (22) of Versailles, was driving westbound on SR705 and was coming up to the intersection of North Star Fort Loramie Rd. York advised a vehicle pulled out in front of him and he swerved to miss the vehicle and traveled across North Star Fort Loramie Rd in to the side ditch on the right side of the road and then attempted to steer his vehicle back on to North Star Fort Loramie Rd. thus causing him to lose control of the vehicle. York's vehicle then rolled over coming to rest on it's wheels. York was treated by Fort Loramie Rescue and was transported to Wayne Hospital where he was treated and released. York had two passengers in the vehicle, Kevin Brandewie (26) of Fort Loramie and Scott Francis (28) of Fort Loramie. Both Brandewie and Francis received injuries from the accident. Brandewie was treated at the scene by Osgood Rescue, but refused any further treatment. Francis was treated by Osgood Rescue and was transported to Miami Valley Hospital by CareFlight and is listed in serious, but stable condition. Family Health Services of Darke County seeks a highly motivated and enthusiastic individual to provide wellness and health management programs for its patients and staff. The successful candidate will have experience in utilizing a self management approach to tailor individualized health plans. Experience in providing individual and group health education is essential. Experience in weight management and smoking cessation is preferred. Licensure as a Registered Nurse is required. This is a full-time position, with a minimum of 32 hours per week. DAYTON, Ohio – Dave Knapp Ford Lincoln will partner with Community Blood Center (CBC) in hosting a community blood drive, Wednesday, May 29 from 3:00 – 6:00 pm in their showroom located at 500 Wagner Avenue in Greenville. Everyone who registers to donate will be automatically entered into a drawing to win a Harley Davidson Road King Classic motorcycle, and will receive a “King of the Road Summer Blood Drive” t-shirt. Donors are encouraged to register at www.DonorTime.com or call Dana Puterbaugh, Darke County - Account Representative @ 937-997-2199 / dputerbaugh@givingblood.org to schedule your appointment. 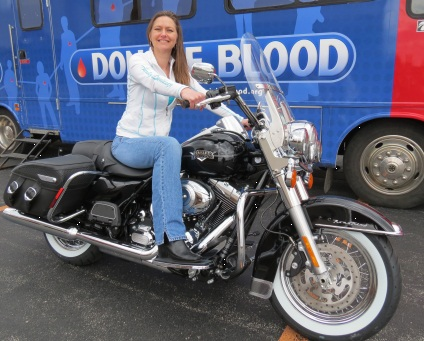 CBC has partnered again with Gover Harley Davidson in Piqua and REACH Magazine to present a dream machine for one very lucky blood donor. Everyone who registers to donate blood at any CBC Donor Center or mobile blood drive beginning Tuesday, May 28 (the day after Memorial Day) through Saturday, Aug. 31 (the Saturday before Labor Day) will be automatically entered in the drawing to win the Road King. Everyone who registers to donate during the summer months will receive a free “King of the Road Summer Blood Drive” t-shirt. CBC will kick-off the campaign with the first t-shirt design, offered Tuesday, May 28 through Saturday, July 13. (A second design will follow July 15 through Aug. 31). The first t-shirt is orange with a black emblem, the classic Harley Davidson colors. The center of the design is a Rout “56” road sign (a play on the original U.S. Highway, Route 66, with the reminder that you can donate blood every 56 days). Harley Davidson wings flank the top of the Route 56 road sign, and two Road King motorcycles are depicted below. The road sign reads “King of the Road Blood Donor – Summer 2013” and below it are the CBC blood drop log and the Gover Harley Davidson logo. Harley Davidson introduced the Road King in 1994 and it quickly reached iconic status. Its bloodlines reach back to the classic 1964 Electra Glide model. Though popular as the ultimate cruising bike, it is also fully equipped for long-distance touring. The Road King Classic model takes the nostalgic look further with extra details like leather-wrapped saddlebags, nostalgic chrome fuel tank console, tooled metal detailing on the fender, tank, seat and bags, and chrome laced wheels with wide whitewall tires. CBC’s Road King will be on display at special events and bike gatherings this summer to remind donors that the dream of owning this classic motorcycle will come true for someone in September. Imagine a Week of Summer Filled with Fun, Friendship and Adventure at Girl Scout Summer Camp! Girl Scout summer camp is being offered in June for a variety of grade levels of girls currently not registered in Girl Scouts. Whether your daughter likes day camp or is ready for an overnight, you can select the date that works best with your families’ schedule. Two different weeks of day camp are being offered to girls in kindergarten through fifth grades. Dates are either Monday, June 3 through Thursday, June 6 at Camp Rolling Hills, Pleasant Hill or Monday, June 17 through Thursday, June 20 at Little House in Greenville City Park. These two day camps run from 10 a.m. to 3 p.m. The cost is $12 and includes a scavenger hunt, crafts, nature hike and campfire cooking. Two survival camp overnights: How to Survive a Zombie Take-Over! are also being offered to girls in fourth through sixth grades. These dates are Friday, May 31, 6:30 p.m. through Saturday, June 1, 12 p.m. at Camp Rolling Hills, Pleasant Hill or Friday, June 7, 6:30 p.m. through Saturday, June 8, 12 p.m. at Little House, Greenville City Park. The cost for each overnight is $20, and includes night hikes, campfire fun, first aid, a Zombie Challenge, evening snack and breakfast. Girls can even earn a patch! 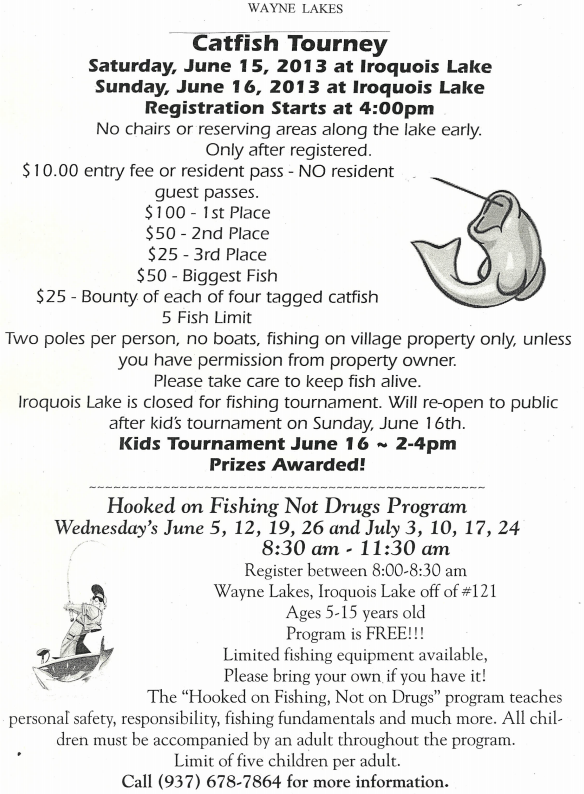 For the overnights, the registration deadline is May 28, 2013. For more information or to register contact Megan Patsch at meganpatsch@girlscoutsofwesternohio.org or 937-279-6533. Join Darke County Parks on Saturday, June 8th at 1:00pm as we welcome Christopher Kline, author of “Butterfly Rider: A Biker’s Long Search for Butterflies”, as he shares stories of his adventures and photographs of the 102 butterfly species he observed. 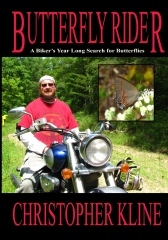 The Butterfly Rider spent 2011 hunting, documenting and photographing butterflies from around the U.S., all from the back of his motorcycle. After the presentation, join us for a walk to search for butterflies at Shawnee Prairie Preserve. The program is free, but pre-registration is required. Call the Nature Center at 937.548.0165 for questions or to register. Copies of his book will be available for sale after the program. COLUMBUS, Ohio – Lawyers working with agriculture must cover a range of legal issues, and an upcoming legal conference hosted by OSU Extension and the Ohio State Bar Association aims to help them stay up-to-date on current legal developments. The fifth annual Ohio Agricultural Law Symposium will take place on Sunday and Monday, June 23 and 24, 2013 at Cherry Valley Lodge in Newark, Ohio. Attorneys will receive Continuing Legal Education credit for attending the day-and-a half-long program. The focus of this year’s program is representing Ohio’s farm and agri-business clients. Two nationally respected agricultural practitioners will teach for the Symposium. Allen Olson from Albany, Georgia, who has farm clients throughout the southern states, will provide guidance on representing farmers in crop insurance disputes and will also share his outlook on federal farm bill policies. Cari Rincker of Rincker Law Office in New York City, whose client base is spread around the country, will speak on protecting the farm client’s business by managing contracts, intellectual property and employment concerns. The program will also include Ohio legal experts on labor, trucking, food safety and estate and business planning. Leah Curtis from Ohio Farm Bureau and Roxi Liming with Adams, Liming & Hockenberry, LLC in Columbus will use a case study approach to discuss advising farm clients on trucking and labor regulations. Russell Cunningham and Jeff Easterday of Barrett, Easterday, Cunningham & Eselgroth, LLP will present on estate and business planning for farm clients and Ohio Department of Agriculture Deputy Director John Schlichter will provide an agency update. OSU’s Hall will speak on advising clients on recent food safety regulations. New this year, the conference will begin on Sunday evening with a bonus 2.5 hour CLE session on Ethics, Professional Responsibility, and Substance Abuse. During the bonus session on professionalism, Allen Olson and Cari Rincker will share strategies for developing and retaining farm and agri-business clients. The Sunday session will conclude with a social reception. Also new this year, the Ohio State Bar Association Agricultural Law Committee will meet on Monday morning. The symposium is a partnership between OSU and the Ohio State Bar Association. For more information, visit https://www.ohiobar.org or contact Peggy Hall at aglaw@osu.edu. Arcanum - On May 26, 2013 at approximately 5:56 p.m the Darke County 911 center received a call in reference to a male subject struck by a tree in the area of Grubbs Rex Rd and Frazier Rd. Darke County Deputies, along with Arcanum Fire and Rescue were dispatched to the scene. Initial investigation revealed that two male subjects were clearing out an area inside the woods. The subjects were cutting a tree that was already lying on the ground, but was attempting to roll the tree over with a tractor. When they pulled on the tree, the tree rolled and a limb struck the operator of the tractor, James Scott Miltenburger (53)of Castine, in the head. Once EMS units arrived on scene Miltenburger had succumbed to his injuries and was pronounced dead at the scene. The Darke County Coroner's Office was then called to the scene. Calls to the OSU Extension, Darke County office vary to a great deal with information needed by you the citizens of Darke County. But without a doubt, the majority of the calls this past winter and spring have been about cash rent and land values in the county. Values have been shared based on what we have heard in the office. Below you will find information compiled by Ohio State Extension. Ohio cropland varies significantly in its production capabilities and cropland values and cash rents vary widely throughout the state. Generally speaking, western Ohio cropland values and cash rents differ substantially from eastern Ohio cropland values and cash rents. This is due to a number of factors including land productivity and potential crop return, the variability of those crop returns, field size, field shape, drainage, population, ease of access, market access, local market price, potential for wildlife damage, and competition for rented cropland in a region. This article highlights the summary of data collected for western Ohio cropland values and cash rents. Ohio cropland values and cash rental rates are projected to increase in 2013. According to the Ohio Cropland Values and Cash Rents Survey bare cropland values in western Ohio are expected to increase from 6.8% to 15.4% in 2013 depending on the region and land class. Cash rents are expected to increase from 7.8% to 10.7% depending on the region and land class. The Greenville FFA Chapter celebrated its many accomplishments, both as a chapter and by its individual members, during the 83rd Annual FFA Recognition Night held on Thursday, March 11th. Approximately 225 members, parents and guests attended the evening held at Greenville High School. Special guest speakers for the banquet were Carly Snider, Ohio District 9 FFA President and Allen Keaser, President of the Greenville FFA Alumni. Six members received “Star” Awards. They were: Star Greenhand Degree, Olivia McDade; Star in Agriscience, Thomas Shaw; Star in Ag Placement, Colton Sherry; and Star in Agribusiness, Alyssa Garber. The Chapter recognized retired advisor Mr Daryl Goodwin for all his hard work and dedication during all of his years of service. Mr. Goodwin was presented the Outstanding Advisor Award. Six outstanding awards were given out to members. They were: Outstanding Freshman, Dylan Kolb and Olivia McDade; Outstanding Sophomore, Korey Garland; Outstanding Junior, Patrick Garber and Emily Vanhorn; and Senior outstanding, Alyssa Garber. The chapter awarded two honorary memberships. The Honorary Chapter Degrees were presented to Mr. and Mrs. Jim and Luann Mann. Thank you for all of your dedication to the future of agriculture. Union City - On May 25, 2013 at approximately 5:08 p.m. Darke County Deputies were dispatched to 13215 Ohio Indiana Stateline Rd. in reference to a male subject with a weapon. When deputies arrived they spoke with two male subjects who advised they were mowing grass at 13215 Ohio Indiana Stateline Rd. when they were confronted by Michael J. Broeker (45) of Union City. Both males subjects advised that Broeker had displayed a handgun advising the subjects that they were done mowing, they needed to leave. Both individuals advised that Broeker then fired several rounds out of the handgun in the general vicinity of them. The subjects reported that they believed Broeker was intoxicated at the time. Initial report also revealed that Broeker fired a rifle in the vicinity of the subjects. One of the subjects did state that he was in fear that Broeker was going to use the firearm towards them. Deputies attempted to make contact with Broeker for approximately three hours over the PA system and by trying to call Broeker's cell phone without any luck. Darke County's SRT was deployed to the scene to continue efforts to try and make contact with Broeker. Finally deputies were able to make contact with Broeker on his cell phone and had him exit his residence to come outside and meet deputies to talk to them in reference to the incident. When Broeker came out he was taken in to custody without incident. Broeker was charged with Aggravated Menacing and Using Weapons While Intoxicated and is currently being held at the Darke County Jail. While the budget bill was still in the Ohio House of Representatives, committee hearings about the budget were posted online, where people could tune in to watch deliberation and testimony about the legislation. Filming committee meetings served a very important purpose, which was to make state government more open to the people of the state. Ohioans deserve to know what their tax dollars pay for. Similarly, letting people and businesses know the rules that affect them is a necessary component to building a fair and prosperous economy. With more than 120 agencies and commissions statewide, there are times when various rules may change to help an agency carry out its purpose. The Joint Committee on Agency Rule Review, more simply known as JCARR, is tasked with making sure that the actions of these agencies are within the boundaries of their authority. Made up of legislators from both the Ohio House and Senate, JCARR reviews nearly 9,000 rules every year. FLYBALL IS HAPPY TO BE BACK IN GREENVILLE! The dogs were back in town for their first flyball tournament in over 6 years! Many spectators came out to cheer on the local & first Ohio team, Extreme Insanity Dog Sports, as they went head to head with some of the fastest teams in the world in the fastest sport on 4 legs…FLYBALL! Extreme Insanity had a great turnout and they want to thank the community for supporting them on their two-day event! They raised money for Friends of the Shelter. Their donation will help maintain the new Dog Park at Darke County's Animal Shelter. They’d like to thank Greenville’s Carefree Connection Bus Tours & Hartzell Veterinary Service for sponsoring their tournament! They plan on bringing their tournament back to Greenville again next year! For more information or to keep up to date on their tournaments throughout the year, call Russell at 937-423-2546 or visit them at www.extremeinsanityflyball.com. The Darke Soil and Water Conservation District (SWCD) will be distributing wildlife food plot seed on a first come first serve basis. This mixture of Sorghums and Millets will provide some of the best winter cover available for pheasants and quail. It will provide both food and excellent winter cover to help increase the winter survival of your birds. This food plot seed is provided by the Darke County Pheasants Forever Chapter. Contact the Darke SWCD at (937)548-1715 extension 3, or stop by the office at 1117 South Towne Court, Greenville for more details. GREENVILLE, OH – A habitat workshop series is being offered to landowners wishing to improve habitat for wildlife and other conservation goals. The workshop series is sponsored by the Ohio Department of Natural Resources (ODNR) Division of Wildlife, ODNR Division of Forestry, Pheasants Forever (PF), Natural Resources Conservation Service (NRCS), The Ohio State University Extension, U.S. Fish & Wildlife Service (USFWS) and the Ohio Soil and Water Conservation Districts. The Grassland Habitat workshop is the second in the series and will take place on Saturday, July 13th from 9:00 am – 3:00 pm on the Rammel Farm located at 6879 Arcanum-Bears Mill Rd., Greenville, OH 45331. This event is $10/person with continental breakfast and lunch and reference materials to take home. The purpose of the workshop series is to offer the landowner and wildlife enthusiast a well-rounded approach to managing their property to establish and maintain wildlife habitat. Each workshop will focus on a specific habitat type or wildlife species. Participants will learn techniques for managing land to benefit both game species and wildlife in general as well as information on funding and technical assistance. This grassland workshops main focus will be CRP mid-contact management, grass & wildflower identification, grassland site prep and seeding, weed control and more. The participants must pre-register with the Darke Soil &Water Conservation District at (937) 548-1715 ext. 3. The registration deadline for the first workshop is July 5th, 2013. Join Darke County Parks on Monday, June 3rd at 6:30pm as we learn how to build an oasis for butterflies (and other wildlife). We will discuss the supplies and plants needed to start your garden and how to get the most out of your area and in no time you will have butterflies flocking to your garden. 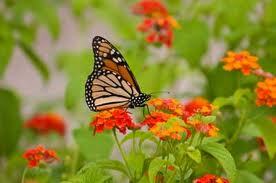 We will also cover common butterflies in Darke County so you can identify who is visiting your garden! This program is completely FREE and you can register by calling 937.548.0165. The summer season means barbecues, picnics, amusement parks, and road trips. As a diabetic, you may worry about how to eat healthy while still enjoying the festivities. Knowing how to create a well-balanced meal will allow you to keep your blood glucose level as close to normal range as possible during barbecues and picnics. Choose lean grilled meats such as chicken breast, turkey burger or fish, instead of fried chicken. Veg out. Grill up some veggie burgers, veggie kabobs, or sliced vegetables. Try snacking on raw vegetables with dip or hummus. Hold the mayo. Mayonnaise adds fat and calories to your plate. Add flavor to a sandwich with sliced tomatoes, lettuce, bell pepper, or mustard. Limit mayonnaise based dishes such as dips, salads and sauces. Watch out for sauces such as BBQ sauces since they can raise your blood glucose. Food items with cream cheese are high in fat. Limit these items and go for fruits and vegetables. Ohio’s wild turkey hunters checked 18,391 birds during the 2013 spring hunting season, according to the Ohio Department of Natural Resources (ODNR). The state total is a 4 percent increase from 2012, when hunters harvested 17,646 birds. The 2013 harvest total is a combination of the youth turkey season and the spring turkey season, April 20-May 19. Ashtabula County again led the state in the number of wild turkeys killed during the four-week season with 766. The ODNR Division of Wildlife estimates that more than 70,000 people hunted turkeys during the spring wild turkey season. Prior to the start of the spring hunting season, ODNR Division of Wildlife biologists estimated the wild turkey population in Ohio to be 180,000 birds. Wild turkeys were nearly eliminated in Ohio before being reintroduced in the mid-1950s by the ODNR Division of Wildlife. Ohio’s first modern day wild turkey season opened in 1966 in nine counties, and hunters checked 12 birds. The total number of checked turkeys topped 1,000 for the first time in 1984. Spring turkey hunting opened statewide in 2000. When I first was elected to the Ohio House in 1983, the Medicaid budget in the state was $3 billion. Since that time it has grown faster than the rate of inflation and is now $26 billion. Medicaid gets more than primary and secondary education and takes up nearly 40 percent of the state’s operating budget. Recently, there was discussion about expanding Medicaid to cover a larger population and that was a bold proposal. It is important as legislators and for our fellow Ohioans to do what we can to help people who are in need. Our ultimate goal is to help them reach the point where they no longer need public assistance. Obamacare is not the answer, and it seems every week we learn of more problems presented by the law. A recent study released by the Society of Actuaries revealed that some Ohioans may see their healthcare premium costs jump by more than 80 percent by 2017 because of Obamacare. With so much uncertainty about the law, the House determined that accepting money from Washington to grow an inefficient program and further extend the reach of the federal government into the states was not the right action to take. Should the Obama administration fail to uphold its end of the bargain, which is a real possibility considering the irresponsible spending taking place in Washington, it would place serious strain on future state budgets. Therefore, after nearly 70 hours of debate and testimony on the budget, Medicaid expansion was stripped from the bill. Shortly after the bill passed out of the House, the Senate announced that it also will not include expansion in its budget proposal. Recently the Greenville School District conducted a survey about the upcoming August 6th bond issue to construct a new K-8 school building facility and renovating the high school. The survey was communicated through various news media outlets and school district evening events. Here are the results of the community members who participated in the survey. 761 people took the survey in which 91.8% were registered voters in the Greenville School District. 47.8% have a child/children attending Greenville Schools. 7% have a child/children at home that will be attending school. 12.6% have a grandchild/grandchildren that attend Greenville Schools and 4.5% have a grandchild/grandchildren that will attend Greenville Schools. The remaining people completing the survey did not have children or grandchildren attending school but were community members. 80.4% felt the educational delivery process can be improved for Greenville Schools with new and/or renovated facilities. 81.7% would support a new K-8 school facility that would improve safety and security for our children by controlling and limiting entrance access points. 83.4% would support a new K-8 school facility that could operate more efficiently and eliminate maintenance cost of aging buildings at Woodland Heights, East, South and the Junior High. 76.5% believe new and renovated school facilities could attract business and industry and improve property values for the community of Greenville. 69.7% of those surveyed felt that new and renovated facilities could reverse the trend of declining enrollment of students at Greenville Schools that has caused a reduction in state funding. 76.1% of the people completing the survey would support the new K-8 facility if it were open at night for senior and community use. Interestingly, only 46.9% of those surveyed knew that the present split of financing with the Ohio Facilities Construction Commission was 57% local and 43% state on a new bond issue for all co-fundable space. 78.8% of those surveyed then said they would support a new K-8 bond issue knowing the state would assist with 43% of the bond issue. Again, this would be for allowable co-fundable space. 79.5% in the survey would support the project knowing a new K-8 facility would improve handicap accessibility to the school for students, parents, and community members. 81.3% supported a new school facility. As always, feel free to contact me with questions on the upcoming school bond issue at my office phone 937-548-3185 or email dfries@greenville.k12.oh.us. Further information can also be found at www.greenvillestrong.com. Please remember Strong Schools, Strong Community. We become our choices. This survey indicates that there is community support for now being the time to upgrade our school facilities and in turn our community. Please join me in supporting the upgrade of our school facilities and therefore enhancing our educational delivery process. The Darke Soil and Water Conservation District (SWCD) and the Ohio State University Extension, Darke County will be jointly hosting a Soil Fertility and Nutrient Management workshop series beginning in June and wrapping up in November. This series will consist of four workshops – June, July, August and November – that will cover basic agronomy, how to obtain a proper soil sample, a tour of a soil lab, understanding and interpreting the results, recommendations and how to properly maintain and enhance your soils, and development of a field plan for 2014. The cost to participate in this workshop series will be $10.00. This registration fee will cover all of your meals, resource materials and soil samples for up to 50 acres. Space is limited, so call or email to reserve your spot today! 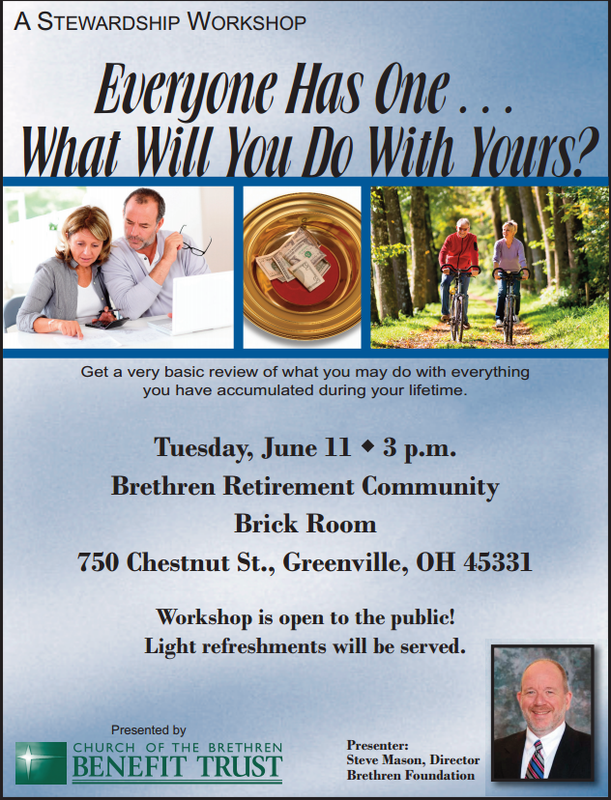 The first workshop will be June 25th at the Darke OSU Extension office on Wagner Avenue in Greenville beginning with a meal at 6:00pm. This first workshop will give an introduction to the series, cover how to properly collect a soil sample and discuss nutrient sources and concentrations. It is important to note that the Darke SWCD, through a series of grants and sponsorships, will cover two (2) samples to be tested from your farm. This workshop series will utilize your samples to walk you through understanding your soil fertility and nutrient management needs. You will need to turn in your soil samples at the office before the second meeting date. The second workshop will take place on July 22nd. The group will meet at the Darke SWCD office at 9:00am before traveling to Brookside Labs in New Bremen. While there, we will tour the facility and visit with available technicians to understand the process of soil testing. This is when and where the samples you pull will be delivered for analysis. After the tour, the group will grab lunch before returning to Greenville.